HP Umpire Dan Bellino ejected Yankees P CC Sabathia and Manager Joe Girardi for arguing balls and strikes in the top of the 6th inning of the Angels-Yankees game. Following a double play to end the frame, Sabathia and Girardi were ejected. Replays indicate Bellino's accuracy concerning callable pitches during the top of the 6th inning was 89% (8/9), with the one miss occurring during the final at-bat of the inning, which culminated in a double play, the call was correct. 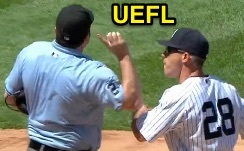 At the time of the ejection, the Yankees were leading, 5-2. The Yankees ultimately won the contest, 6-2. These are Dan Bellino (2)'s first and second ejections of 2015. Dan Bellino now has 8 points in the UEFL Standings (0 Previous + 2*[2 MLB + 2 Correct Call] = 8). Crew Chief Tom Hallion now has 3 points in Crew Division (1 Previous + 2 Correct Call = 3). These are the 76th and 77th ejections of the 2015 MLB Regular Season. This is the 36th player ejection of 2015. Prior to ejection, Sabathia's line was W, 6.0 IP, 5 H, 2 ER. This is the 35th Manager ejection of 2015. This is the Yankees' 2/3rd ejection of 2015, T-2nd in the AL East (BAL 4; BOS, NYY 3; TB 2; TOR 0). This is CC Sabathia's first ejection since July 21, 2006 (Chris Guccione; QOC = U [Balls/Strikes]). This is Joe Girardi's first ejection since September 16, 2014 (Rob Drake; QOC = U [Warnings]). This is Dan Bellino's first ejection since September 11, 2014 (Casey McGehee; QOC = U [Fighting]).